Humph…such a restless flier! 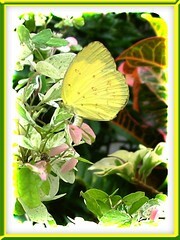 This lovely yellow butterfly rarely stops to enable me to capture its image. Very often, the moment I glimpsed it flying around the Pithecellobium dulce ‘Variegated’ (Variegated Madras Thorn) in our garden, I’ll zoom in with camera but end up disappointed many a time. 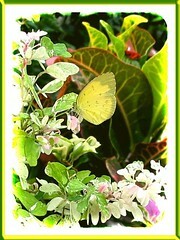 E. andersonii, one of the several common yellow Eurema species is a small sized butterfly with wingspan about 4cm, and displaying attractive yellow ground color and blackish-brown trimmings on the upperside of both pairs of wings. On the underside, there are some scattered brown markings and a typical one cell spot on the forewing, hence this beauty is commonly named One-spot Grass Yellow. There are some tiny green caterpillars foraging the leaves of Variegated Madras Thorn and I’m wondering whether these belong to the E. andersonii that frequents our plants, almost daily? Range: India, Myanmar, Thailand, Malaysia, Singapore, Sumatra and Java. Habitat: Nature reserves, undergrowth at forest fringes or gardens. More information at Butterfly Circle and some images here. Peacock Pansy came visiting again and again!